UPDATE: A man’s death after being hit by a Metra passenger train has been ruled a suicide. Looking toward westbound Train 631, which was involved in a train vs. pedestrian incident about 5:17 p.m. and was stopped near the Jewel-Osco, 122 North Vail Avenue. Accident scene is to the left of picture — out of range of the photograph (photo submitted by a Cardinal reader). 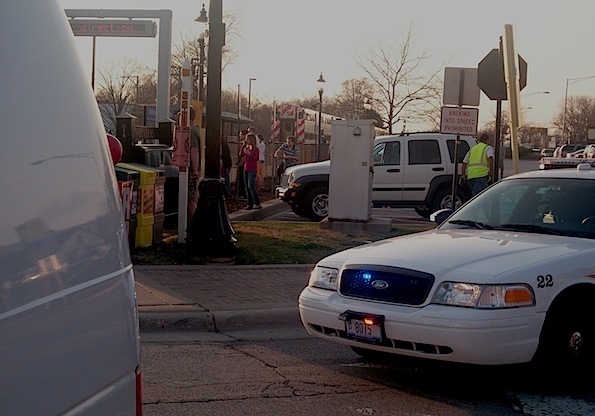 Arlington Heights police and firefighter/paramedics responded about 5:20 p.m. Friday to a train vs. pedestrian incident on the Union Pacific Northwest Line near Vail Avenue, which is the furthest west grade crossing in the downtown area of Arlington Heights. Police were immediately working on an accident investigation involving a fatality. Metra police were also on the scene. Metra trains were stopping Mount Prospect and unloading outbound passengers in Mount Prospect. Many passengers were seen walking westbound along the Northwest Highway sidewalk past Mariano’s Fresh Market. Arlington Heights police handed the scene over to Metra police at about 7:38 p.m. Friday. Metra also began to run trains through downtown Arlington Heights about that time. On the Metra schedule, Train #631 departs Chicago at 4:45 p.m. and stops at Clybourn at 4:54 p.m. Train #631 is an express train all the way to Barrington, with a scheduled arrival time of 5:27 p.m. The end of the line for Train 631 is McHenry, with a scheduled arrival time of 6:02 p.m.